The Fisher-Price Nursery Monitor, sold in North America in the early 1980s, was engineered to transmit any noise from the nursery to a wireless receiver accompanying a parent in another part of the home. However, just like many other baby monitors, this model was known for its pesky audible interferences with signals from radio, static, cordless phone or even from neighbour’s baby monitors. Furthermore, as with any audio input/output system, when both units are in close proximity they produce disruptive audio feedback. Not great for sleeping babies. Darsha Hewitt built a whole installation that exploits these inherent glitches and she appropriately called it Feedback Babies. 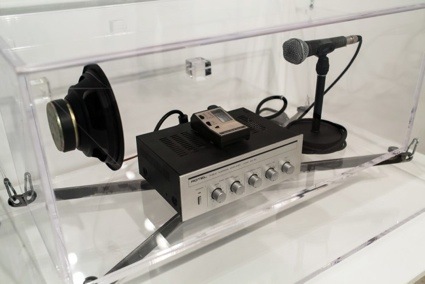 The receivers are attached to motors and slowly bow back and forth in front of the emitters, creating a subtle soundscape of nuanced feedback patterns and squelching radio interference reminiscent of the whimpers of crying babies. Hi Darsha! How did you find out about this late ’90s model of Fisher-Price Nursery Monitor? I grew up in the heyday of Fisher-Price technology – I had the baby monitors around when I was a kid. I had younger siblings so we had them in our home – I had a babysitter, she had them too. More recently, they became a common cast-off in the home electronics aisle at second hand stores. My dad was an antique dealer so the act of collecting old things in multiples comes naturally. Also, I’m a sucker for old radio technology and who doesn’t love the idea of walkie-talkies made for babies? And why did you focus on its glitch? 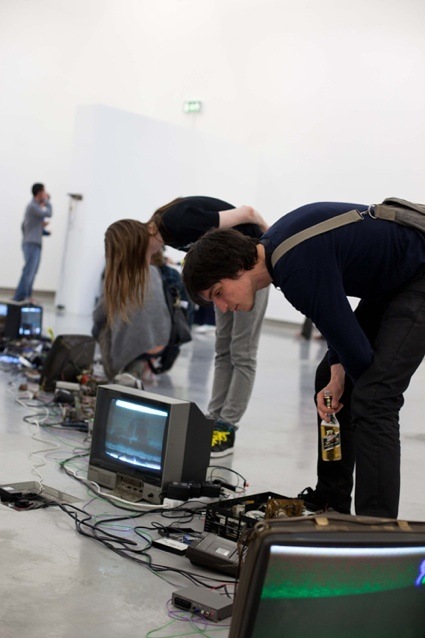 Audio feedback and radio interference are commonplace in sound art. These particular baby monitors seem to have somewhat of a cult following within experimental music. I’ve seen them used in performances and they are often subjected to circuit bending. When the receiver and transmitter are used in extreme proximity they cease to function as a device for one-way human communication. Instead the internal voice(s) of the machine takes over. Depending on how you position them, the sonic distortions can range from Walt Disney style bird song to eerie whimpering. By rigging-up the transmitters slowly bow in front of the transmitters they oscillate through this tonal range. As a group they fall in and out of synchronisation and develop some sort of strange inter-machine worshiping pattern…the overall effect is mildly creepy. What made you decide to bring emphasis on them? I am particularly drawn to their scale and volume limitations – in a way they remind me of babies. When a newborn belts out a scream from the top of their lungs it can be shrill and alarming, however; since baby anatomy is so mini its cry is still quite weak and helpless. 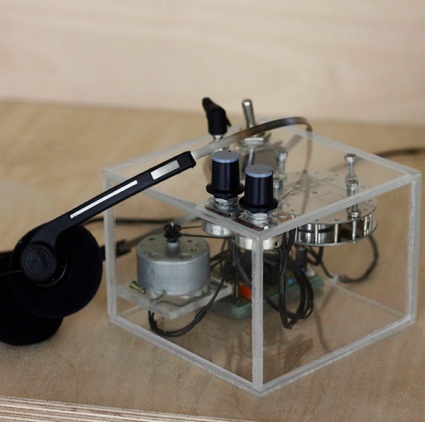 Similarly, even though these machines are feeding back and generating interference to their maximum capacity, their signals are weak and much more subtle than the more balls-out approach to noise that often dominates experimental music and sound art. Why do you leave all the wires and electronics uncovered? 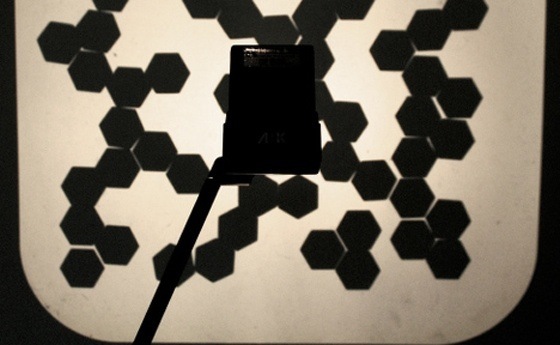 Electricity is my medium and I enjoy working with its related material dimension. These are domestic electronics – cables and wires are part of everyday life, why should they be concealed? You seem to work a lot with outdated technological devices. What do you find so fascinating in them? I am skeptical of certain forms of innovation. As I mentioned above, my dad was an antique dealer – I was taught to value the quality and craft of objects from the past. Furthermore, the practice of planned obsolescence that inhabits industry generates an abundance of discarded electronic devices. This surplus is an economical and steady source of art supplies. Since old technology is inexpensive and readily available, I am free to experiment without fear of failure because I know there will always be more. In my studio I deconstruct these machines as a starting point to gain material knowledge – if I am lucky, artwork emerges. 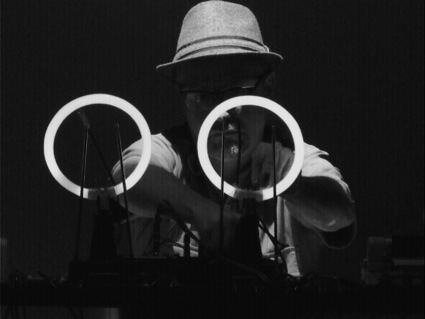 Feedback Babies will be at the Sight + Sound festival in Montreal this month, along with Crystal forming robots and Phonotube, making music with light.